Transition Towns US will be holding its first national gathering July 27 – 30 at Macalester College, St. Paul, Minnesota. There will be a two-day intensive, Thursday, July 27 and Friday, July 28, with one and two-day workshops; followed by the main program consisting of keynotes and 40 one to two hour workshops on a variety of topics related to building resilient, sustainable communities. For the full program visit: https://www.transitiongathering.org. This movie is playing at the Savoy this week. It was previously shown at the Green Mountain Film Festival. Its “Tomorrow” and it has a bunch of really optimistic stories about changes taking place at the local level around the world. The film even includes Transition founder Rob Hopkins talking about how they created local money in Totnes. Show times can be found here. It has been four months since the Sustainable Design Competition, hosted by Net Zero Vermont. Many people participated in this process by reviewing proposals, attending presentations, and voting. Hundreds of people provided thoughtful reactions to the designs over the course of the competition. The winning design was awarded to Team Bridges. The majority of the votes were divided among the other four design finalists. These teams deserve our praise as well, for the useful ideas that they provided. The big takeaway from the collective responses is that people support the sustainable redevelopment of our downtown, the transformation of our parking system, and greater access to the riverfront. “What next?” Your response will provide a partial answer, because YOU are what is next. The sustainable redevelopment of Montpelier is a massive undertaking requiring the action and support of the whole community. This is not an urban redevelopment project, rather a “change agenda” which will lead to new ways in how we will live, shop and travel in the future. To help translate local interest into concrete future projects, the organizers of the competition have formed a new non-profit – Sustainable Montpelier Coalition (SMC). Its Mission is to enable a high quality of life experience in Montpelier by modeling energy independence, economic opportunity, climate resilience and community interaction. This summer the coalition will be asking you for input and giving you opportunities for participation. This transformation will work because of your involvement. As a community we have many gifts, talents and resources. The coalition looks forward to engaging your passion, wisdom and talent. Together, we can build a future for Montpelier not only for our future, but for our children’s children and beyond. If you have any questions, ideas or wish to commit to this effort, please send an email to info@sustainablemontpelier.org. Vermont is a leader when it comes to setting goals to reach a more resilient future. Read more about it here. This summer we’re offering our very popular Running With Artemis course in a weekend intensive format (July 7-8), which is perfect for people who live far away or have a professional schedule that prevents them from attending our usual Monday afternoon series. Come learn to shoot a bow and arrow while running a 5k and awakening your wild Artemis self! Transition Town Montpelier’s Village-building Convergence has become a summer tradition in the area. The VbC is about empowering people with the knowledge and skills needed for a sustainable, resilient future. It’s varied in scope from a day to a week. This year, it’s going to be a “lite” addition to the regular solstice celebration at All Together Now Community Arts Center in East Montpelier: A permaculture walk and discussion in the site’s lovely and growing permaculture plantings. 5 p.m. Gathering for potluck. Please bring food and drink to share, and your own plate, silverware, and drinking vessel. 7 p.m. Permaculture discussion and walk. Janice Walrafen of All Together Now has helped plan and install the site’s plantings. She’ll talk about their goals, how they’re achieving them, and future plans; ideas from others are welcome! 9 p.m. Bonfire with fireworks. There may be fun, puppet performances, and song along the way, too! All Together Now is at 170 Cherry Tree Hill Road in East Montpelier, not far from East Montpelier village. More information is at their web site, alltogethernowvt.org. Join AmeriCorps members, Emily Markstein and Rebecca Harris, for this presentation and discussion about the various terrestrial invasive plant species found throughout Vermont and how permaculture can be utilized when replacing and displacing these invasive species. Co-sponsored by the Kellogg-Hubbard Library and the Montpelier Department of Parks and Recreation. Transition Town Climate Talk THIS MONDAY!!!! There’s a big thaw underway. Northern Siberia, Canada, Alaska and the Arctic Oceans are getting cooked. Find out how this rapidly-accelerating warming is affecting the world’s permafrost regions. Dramatic developments of just the past 3-5 years are throwing the Arctic north out of balance, and are rapidly changing the weather for North America. Vast and rapid swings of weather, smashing storm fronts and big swings of temperature are part of it, as are huge dumps of rain and snow, and high winds. These changes will stress our community cohesion, and emphasize the fragility of modern culture. Explore how we can respond as conditions unfold in unpredictable and perhaps extreme ways. The New England village is uniquely positioned to develop ways to share these burdens together. The newly formed Montpelier Complete Streets Group Committee will be hosting their first event, a pedestrian scramble! Pedestrian Scrambles have taken place in cities across the United States. Destinations are marked on a map and your goal is to find as many as you can before time runs out. It’s a great way to get out, walk with friends and explore your own city! How will the Montpelier Pedestrian Scramble Work? You can also register the day of the event! 2) a descriptive list of Scramble destinations along with questions about destinations. Each individual or group will have 15 minutes to plan which destinations to find and the routes you’ll take. Note destinations have varying point values. All participants will start at 2:15 PM and return by 4 PM. If participants who don’t have time or energy to ‘scramble’ up to 4 PM, they are welcome to return anytime to the Finishing Location. After finding a destination, answer the questions about the destination. Incorrect answers/ late returns may be penalized. Small Prizes for Winning Categories! Hope to see you there! Annie McCleary will be leading Wild Plant Walks this Thursday, April 27 from 4:30pm to 6:30pm, and Weds, May 3 from 5pm to 7pm at Wisdom of the Herbs School, 1005 County Road, Woodbury. Build your tree, shrub and herbaceous plant identification skills, and learn edible and medicinal properties. We will go out in a light rain. Sliding scale 0 to $20. Pre-register by phone at 456-8122 or email at annie.mccleary@gmail.com or just show up. We are fortunate to live in an area with incredible plant-diversity! After a few years of dormancy, Burlington Permaculture has sprouted once again! We’re looking for people passionate about creating a more vibrant, resilient community to join the discussion and contribute to the revival of our network. For our first two events, we plan to create space for folks to share their vision and develop projects and initiatives for the weeks and months ahead. Community members, business owners, farmers, gardeners, teachers, builders, public officials and students… tell us how you’d like to help foster greater resilience, vitality, and interconnectedness in our neighborhood. On April 4th from 6:00 – 7:30pm, we’ll begin with an overview of permaculture and its applicability to life in the greater Burlington community, share a bit about the history (and future) of Burlington Permaculture, and leave ample space for discussions and brainstorming about possible projects and outreach focused on environmental and social justice, urban food production, ecological building and renewable energy, food sovereignty, ecological economics, community governance, and more. We extend a special invitation to people who may be willing to be part of the organizing team. Our second gathering (May 3rd from 6:00 – 8:00pm) features a facilitated open-ended, topic-based discussion on our vision for the betterment of Burlington. This ‘Open Space’ style event makes space for small group discussions on the topics dearest to those in attendance. And in the true spirit of Permaculture, we hope to place far more emphasis on crafting solutions than complaining about problems. We’ll conclude the evening with a group update and discussion and make plans for our next community get-together. We hope you can make it – all are welcome! 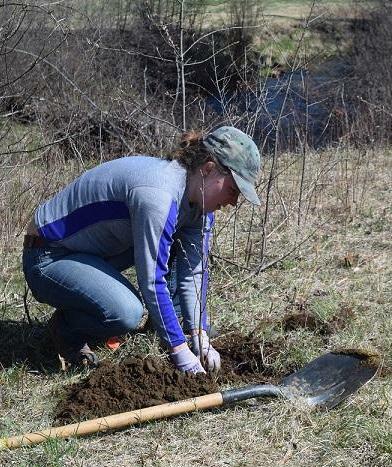 Each year, Friends of the Winooski work with landowners and volunteers throughout the watershed to improve streamside buffers that help reduce erosion and improve water quality and habitat. This May, the Friends will be planting in Plainfield, Marshfield, and Stowe. Individuals and volunteer groups from a wide range of area schools, organizations, and businesses will help us get the trees (and shrubs) in the ground. The restoration of riparian buffers improves water quality to prevent sediment, nitrogen, phosphorus, pesticides and other pollutants from reaching a stream. Last year we planted 2,250 trees and shrubs on five properties–totaling more than 6.5 acres–and performed site maintenance, such as removing knotweed, from around 8 acres of recently planted sites. Site maintenance improves the growth and survival of planted stems, accelerating buffer function. Want to help? Take a look at our schedule below. New volunteers sign up frequently, so plantings may hit a cap and close to the public. Click here to inquire about current volunteer needs. Epic Skill Swap is a participatory weekend festival where you can learn new skills, share the skills you have, and spend a couple days with an amazing group of people. Let’s use our knowledge and the knowledge of others to build the kind of world we want to see. Learn more at epicskillswap.org. Epic Skill Swap is a chance to teach others what you know, and learn what others have to share. It’s a chance to foster both self-reliance and interdependency by tapping into knowledge within existing social networks. Not everyone who attends will necessarily teach a workshop, but this event is all about creating an experience that is shaped more by its participants than by its organizers. We aim to create a space and a framework in which participants can share and learn, but the real magic comes from the people who attend and contribute to making this the most amazing experience it can be. Spring is here and it’s time for a new session of Running With Artemis — a 7-week women’s running archery course in Worcester, Vermont. Presented by Joshua Faulkner, the Farming and Climate Change Program Coordinator for UVM Extension’s Center for Sustainable Agriculture. Farmers are on the front-lines of climate change and agriculture is being forced to adapt. Climate projections indicate Vermont will experience increased precipitation and more frequent and intense storms and flooding, as well as drought periods of greater severity. In this talk we will discuss observed and expected impacts on farms, some of the most promising strategies for adapting our agricultural systems, as well as current research and outreach efforts to help Vermont farmers become more resilient. This event is free and open to the public. Tuesday, April 4 at 7:30 at Goddard College in the Clockhouse. In this documentary, Leonardo DiCaprio visits sites around the world that are being impacted by climate change – the Alberta tar sands, the Arctic, Miami, China, India, the South Pacific Islands, the coral reefs in the Bahamas, and the forests of Indonesia – and meets with climate scientists, energy experts, government leaders, entrepreneurs, and faith leaders to discuss solutions. ATTEND break-out discussions on: Heat Pumps; Weatherization; and Going Solar. FOOD & REFRESHMENTS served onsite, and FREE ICE CREAM! The Fair draws 600-700 attendees and exhibit space sells out every year. Hosted by the volunteers of Waterbury LEAP. Visit www.waterburyleap.org for more details. Our vast, globalized industrial food system has provided for a more diversified diet and a great deal of cheap food. Lost, however, is the connection between consumers and the people who produce their food. This film explores the six aspects of Vermont’s local food system – Production, Processing, Distribution, Farm to Institution, The Consumer and Food Waste. You can see a preview of the movie here. Visiting scholar David Orr will speak on climate change and climate policy in the Trump presidency, and how we can grow and implement practical visions of sustainability and resilience. This talk is free and open to the VT community. Copies of some of David Orr’s books will be available for purchase at the talk. David Orr is the Counselor to the President and the Paul Sears Distinguished Professor of Environmental Studies & Politics, Emeritus at Oberlin College. He is the author of eight books, including Down to the Wire: Confronting Climate Collapse (Oxford, 2009) and Dangerous Years: Climate Change, the Long Emergency, and the Way Forward (Yale University Press, 2016.) In the past twenty-five years, he has served as a board member or adviser to ten foundations including the Rocky Mountain Institute, Bioneers, and the Aldo Leopold Foundation. He is currently a Trustee of the Alliance for Sustainable Colorado, and the WorldWatch Institute. He has been awarded eight honorary degrees, a Lyndhurst Prize, a National Achievement Award from the National Wildlife Federation, leadership awards from Second Nature (2012) and from the U.S. Green Building Council (2014), and a lifetime achievement award from Green Energy Ohio. Transition Town Montpelier is a sponsor for this event. Leonardo DiCaprio visits sites around the world that are being impacted by climate change – the Alberta tar sands, the Arctic, Miami, China, India, the South Pacific Islands, the coral reefs in the Bahamas, and the forests of Indonesia – and meets with climate scientists, energy experts, government leaders, entrepreneurs, and faith leaders to learn about solutions. Free and open to the VT community. This talk will cover the work of the New Community Project (NCP). An international non-profit working to join hands with other people around the world and locally to work for compassion, justice, and ecological healing as a foundation for building a non-violent culture. Come learn about how NCP is trying to figure out ways that we can divest from destructive systems that we have in our culture and build things that give people something to say “yes” to and get excited about at our Sustainable Living Centers. These sites are where NCP puts our principles into practice. They model, teach and advocate for energy efficiency, eco-building principles, sustainable transportation, engagement with their communities, and hospitality/outreach to people on the margins of society. Originally from Middlebury, Pete Antos-Ketcham developed his interest in working to solve social and ecological issues while at the Keewaydin Environmental Education Camp in Salisbury and as a backcountry caretaker in the Green and White Mountains. 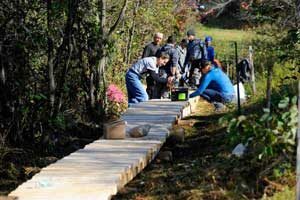 In 2015, he and his family started the New England Sustainable Living Center for the New Community Project on their homestead in Starksboro. WEBINAR: Wednesday, February 8th at 7 p.m.
Join a LIVE webinar with Vermont Senator Bernie Sanders on Wednesday, February 8 at 7 p.m. for ideas on how to tackle global warming. Hear what Bernie thinks a fossil fuel-favoring administration and a Congress dominated by climate deniers means for the world’s most pressing environmental challenge – and what we can do about it. All you need to do is register and you can participate from anywhere with an internet connection. Senator Sanders will be joined by Addison County State Senator Christopher Bray and a few of Vermont’s leading environmental advocates. Beyond the federal framework from Bernie, you’ll get an overview of the 2017 legislative outlook and some ideas on what you, as a concerned citizen, can do to continue forward momentum on climate change – in Vermont – and beyond. Don’t miss this unique opportunity to hear directly from Senator Bernie Sanders. Register today and join Bernie and hundreds of others at 7 p.m. on February 8th. This should be an amazing conference with keynote speakers Dr. Fernando Funes Monzote from Cuba, and Indian scholar and environmental activist Dr. Vandana Shiva. Learn more and register here. The parklets have been in Montpelier for two years now. It was a pilot program, and now we have to decide if we keep it going as a permanent part of the downtown landscape. Surveys of people downtown have shown that visitors enjoy a place to sit and relax, but some business owners have complained that parking for cars is more valuable. The City Council will discuss this issue on Wednesday, February 8. The meeting starts at 6:30 at City Hall. If you like the parklets and want them to continue, this is your chance for public input. Carshare will be ending in Montpelier April 30. This was a two year project partially funded by VTRANS. Funding has run out and participation was not strong enough to make the project viable. This is very unfortunate for the users of the service, many of whom have made the conscious choice to live without a car. Thank you, Carshare. Thank you, Carshare users. And thanks to those who tried to promote this service. We’ll explore the unique ecological importance of Chaga and its polypore (wood eating) relatives, developments in their uses as agents for radiant health, and how to best approach their harvesting and preparation that encourages symbiosis and longevity for us as well as them. Elliot Cluba is a naturalist, herbalist, nature awareness and primitive skills educator, and a juice fasting and detoxification consultant. He has been harvesting local plants and fungi for use in his line of herbal remedies for years, and is most passionate about connecting the individual to the life of their bioregion with sustainability as the focus. The five finalist designs will be presented to the public Saturday, January 7, 3:00-5:30 at the Pavillion Auditorium in Montpelier.